Besides the variety of vivid colors and styles available, there's another reason to love bluestone - thermalling. Thermalling or flaming is the process of using an acetylene torch to remove imperfections from stone. And, it works really well on certain types of natural stone like bluestone. So why would you use a torch on a rustic material like stone? Over the last ten years, bluestone has become an increasingly popular choice for Raleigh homeowners. It's a great design pick for walkways, patios and steps, because it pairs so well with brick and comes in an array of sizes and shapes. For walkways and patios, stone centers offer bluestone in both cut pattern and random shapes. Cut pattern shapes are dimensional and sold in 6" increments. Random pattern is irregularly shaped, and the surface is generally rougher than cut pattern. Thermalling can be used to remove flaws, scratches or even paint marks from bluestone walkways and patios under construction. "Thermalling is probably not a job for do-it-yourselfers, but ask your masonry contractor about it the next time you're planning a bluestone project." 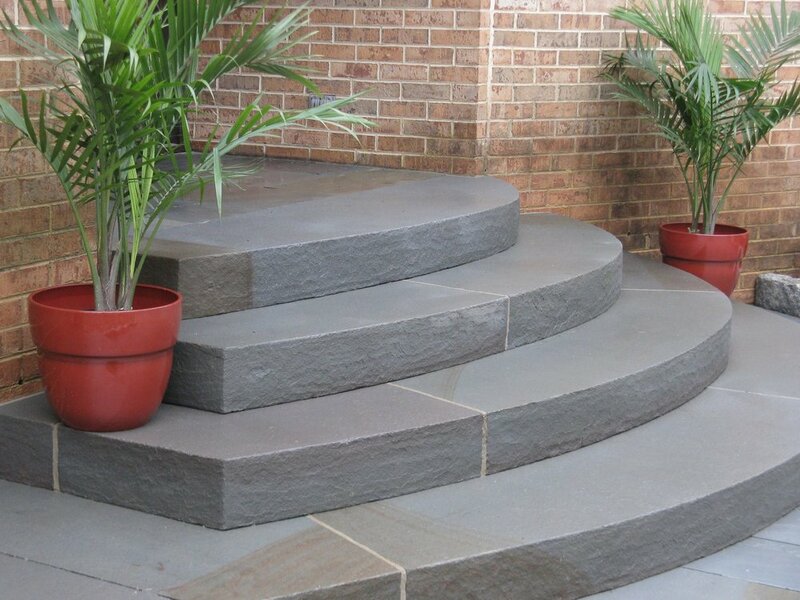 In addition to the thinner bluestone that's sold for flatwork, step treads are available in 2"-6"+ pieces. These thicker pieces are sometimes hand cut, carefully shaped and then used with the edges visible, like in the photo above. Those steps were custom designed and crafted for a family in Wake Forest who wanted a more dramatic entrance to their home. They were made from 1,200 lb. rectangular slabs that measured 6½' long x 2½' wide x 6" thick. During the installation process, grinders and saws were used to create the curved shapes seen above. Before thermalling, the sawn edges looked obviously fabricated. They were lighter in color and unusually smooth. During thermalling, a thin layer of stone was removed for a more natural looking surface that matched the other unworked surfaces. The photo above shows a similar piece of bluestone being thermalled. The area on the left has not been thermalled yet. Of course, safety precautions are necessary when using an acetylene torch for any reason. It's also a good idea to wear a dust mask with a HEPA filter when working with stone. Thermalling is probably not a job for do-it-yourselfers, but ask your masonry contractor about it the next time you're shopping for stonework. When it's done right, thermalling ensures you'll get the most professional result with bluestone. For ideas and inspiration using bluestone, visit our portfolio. Your questions and comments are welcome below. It's a blog about stonework, history and happenings around Raleigh, NC or further than a stone's throw away.